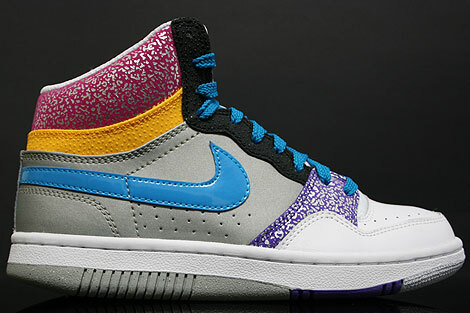 This Nike WMNS Court Force High in the Medium Grey Turquoise Varsity Purple Rave Pink colourway is made of white leather on the toebox and mudguard, pink and purple accents with a silver print on it, turquoise swoosh and laces, medium grey side panels and black/melon accents. The tongue is made of white nylon and the lining of white mesh. Your best friend for the spring/summer season!